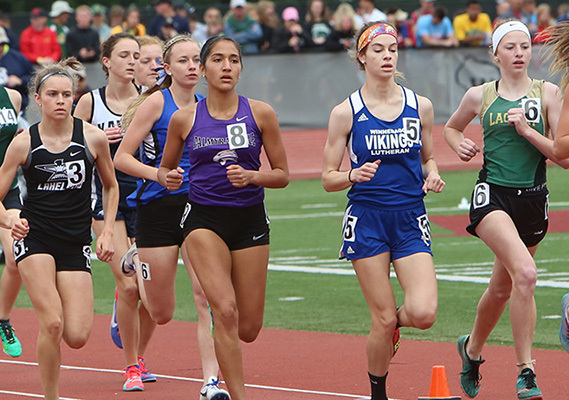 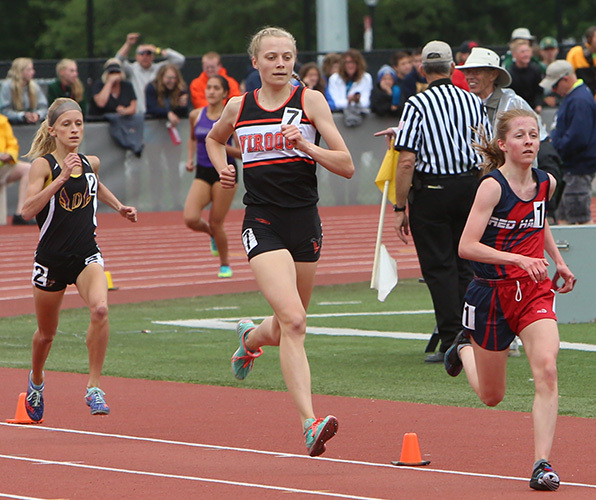 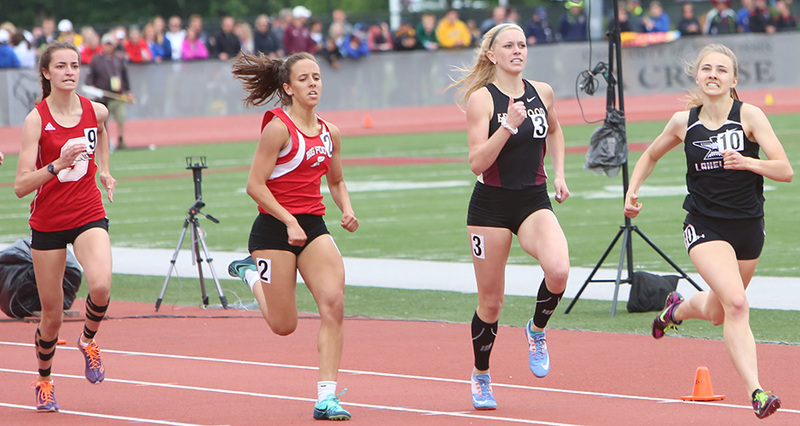 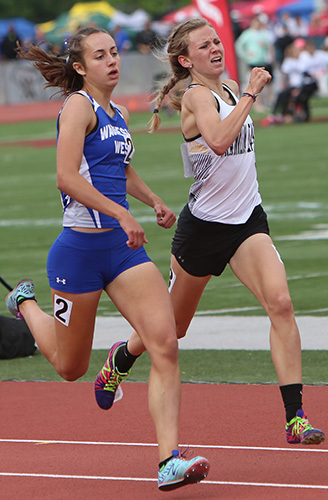 Sophomore Marissa Ellenbecker from Edgar [#2 above right] won the 1600m in 5:14.12. 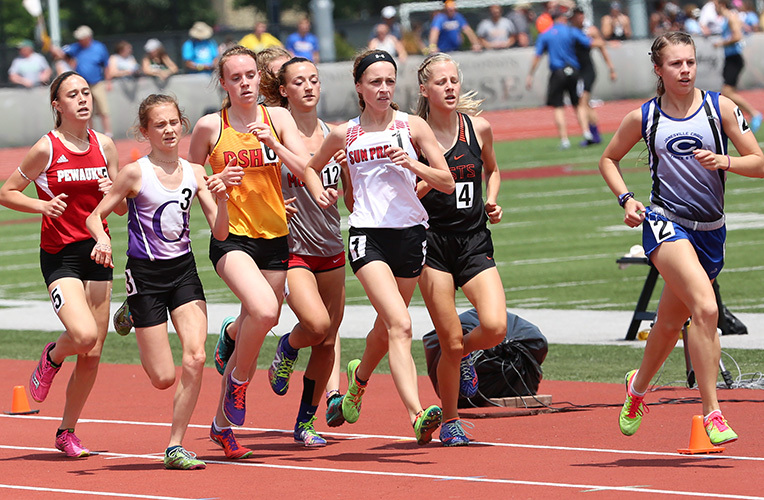 1600m runners above L-R: Rachel Lawton [Flambeau, 6th], Syvia Hansen [Gillett, 2nd], Meygan Benzing [Dodgeland, 5th], Iola-Scandinavia runners Jada Beacom [7th] and Erika Kisting [4th], Elise Large [Ozaukee, 3rd], and winner Marissa Ellenbecker. 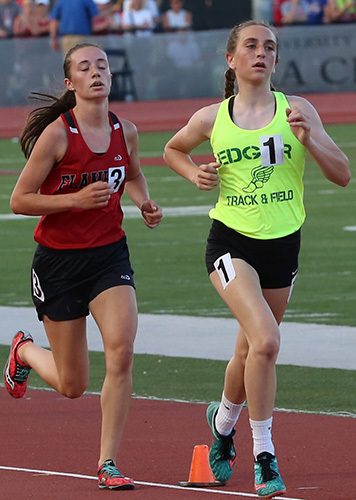 Edgar's Marissa Ellenbecker won the 3200m in 11:19.48. 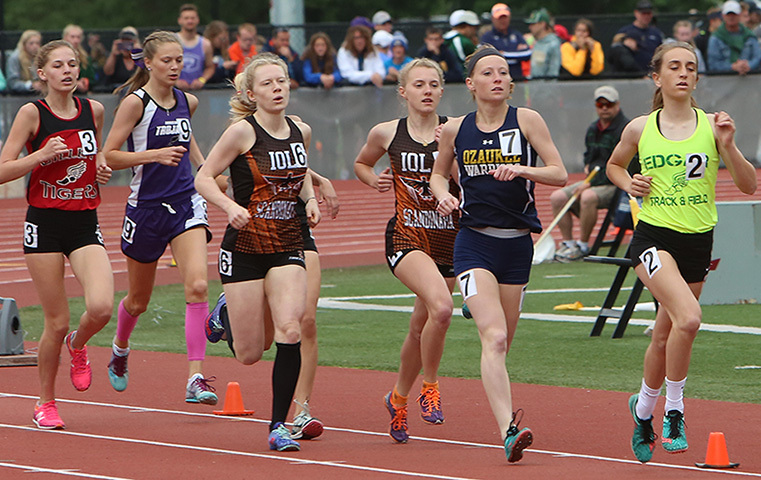 Rachel Lawton [Flambeau, 3rd], Ellenbecker, Elise Large [Ozaukee, 2nd], Nicole Koski [Chequamegon, 17th], and Ellenbecker. 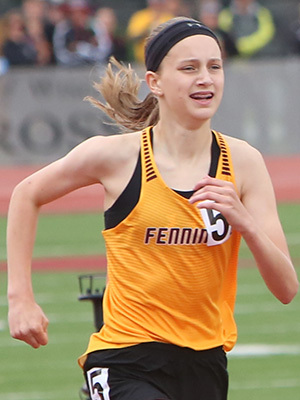 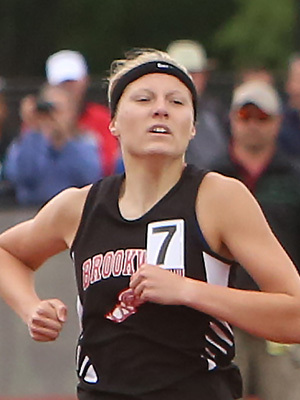 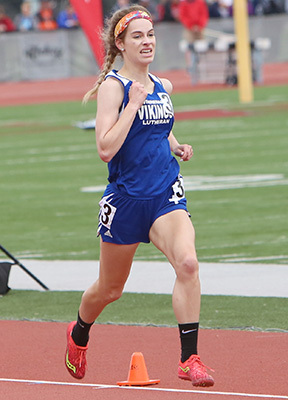 Junior Dana Feyen from Gale-Ettrick-Trempealeau won the Gold Medal in the 1600m run with a time of 5:00.20. 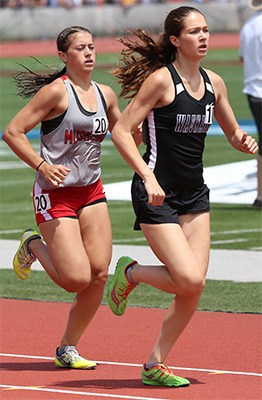 Dana Feyen, Leah Kralovetz [Denmark, 2nd], Jillian Weston [Viroqua, 3rd], and Feyen. 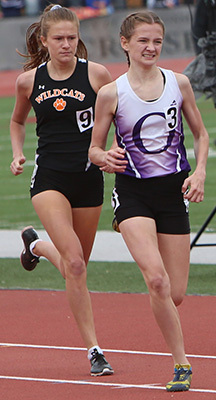 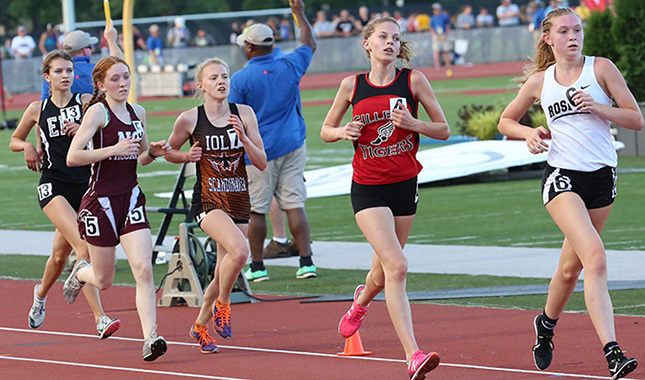 3200m runners above L-R: Leah Kralovetz [Denmark, 2nd] and Champion Dana Feyen [G.E.T., 10:36.06]. 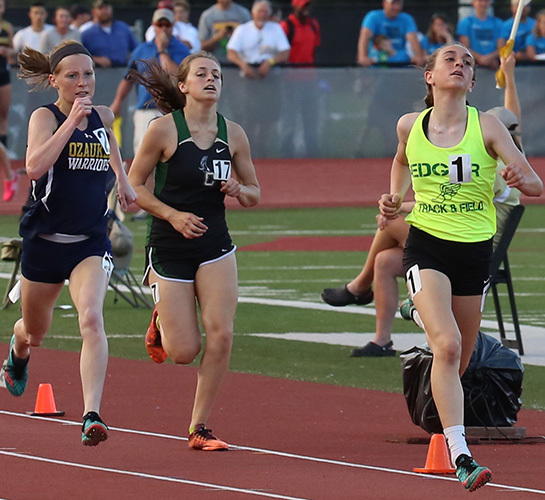 3200m runners above L-R: Anika Homan [Fox Valley Lutheran, 8th], Ella Weaver [McFarland, 11th], Annie Higgins [Xavier, 7th], Olivia Moll [St Croix Central, 12th], Antonia Bartolotta [Palmyra-Eagle, 9th], Lauren Vosters [Freedom, 3rd], Marie Hamlin [St Croix Central, 4th], Ashley Peterson [Lakeland Union, 5th], Alicia Kawa [Medford Area, 10th], and Mariah Linse [Jefferson, 6th]. 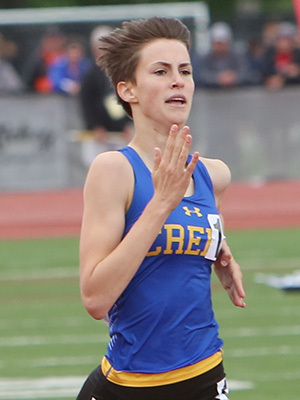 Janesville Craig senior Peyton Sippy [#2] completed the 'Trifecta' of distance races in D1 by winning the 2017 D1 XC Championship at Wisconsin Rapids and the D1 1600 and 3200 events at La Crosse. 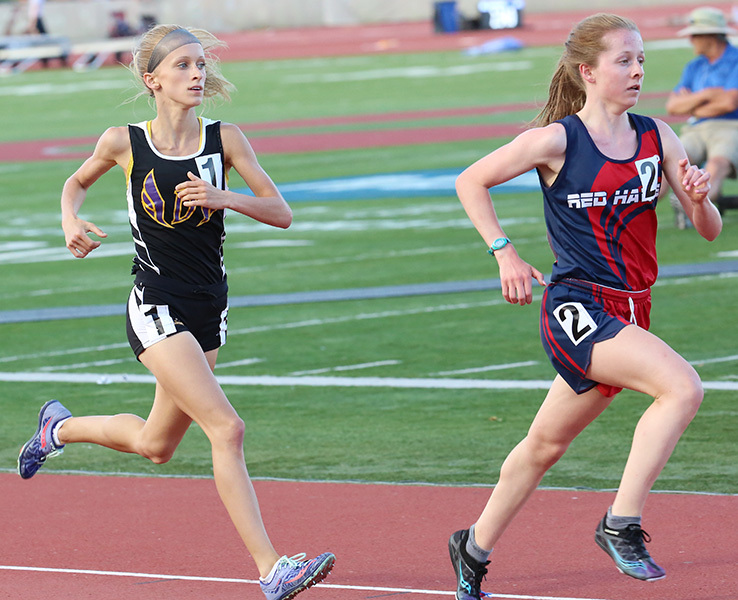 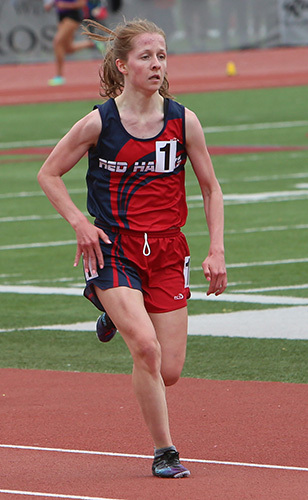 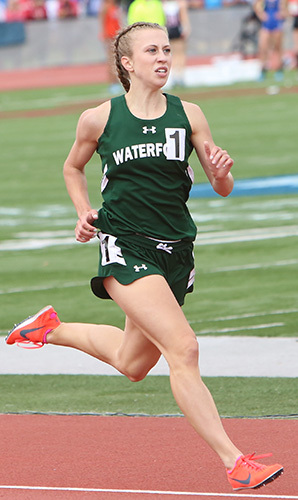 She is shown above in the 1600m run [4:53.41]. 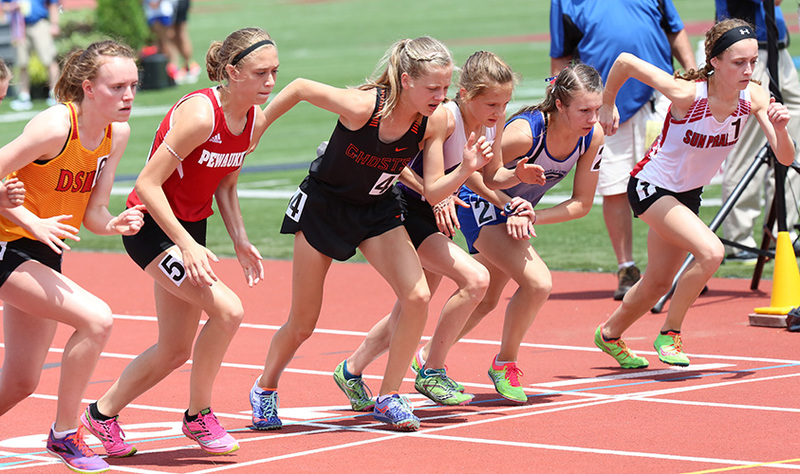 Runners above L-R: Anna Fauske [Kaukauna, 5th], Katie Rose Blachowicz [Sun Prairie, 7th], Kate Sperka [Muskego, 4th], Kate Jochim [Muskego, 2nd] and winner Peyton Sippy. 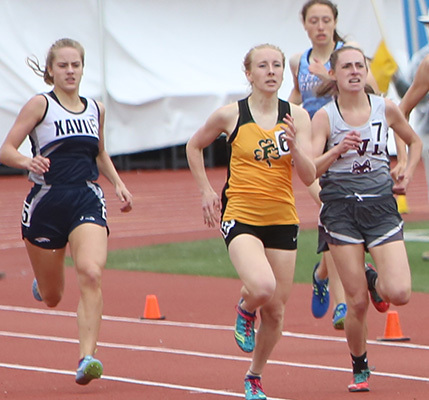 Start of the 3200m run L-R: Meghan Scott [DSHA, 8th], Zoe Goodmanson [Pewaukee, 13th], Anna Fauske [Kaukauna, 3rd], Kora Malacek [Onalaska, 5th], Gold Medal winner Peyton Sippy [Janesville Craig, 10:42.01], and Katie Rose Blachowicz [Sun Prairie, 4th]. 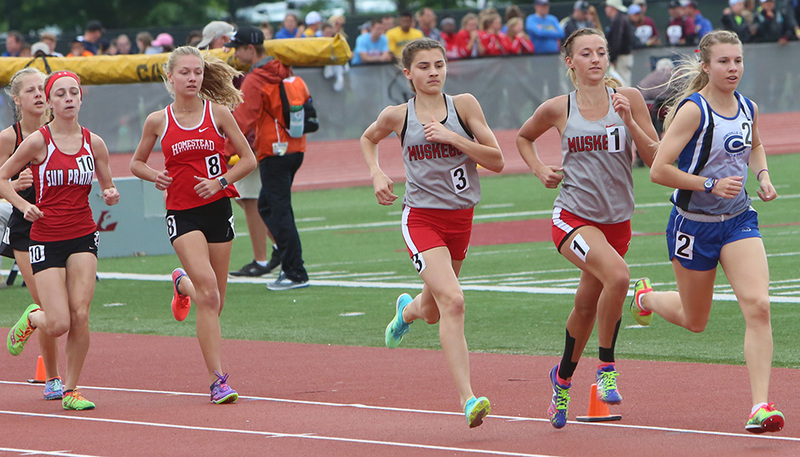 3200m runners L-R: Rachel Ball [Hudson, 12th], Sami Stieve [Germantown, 11th], Annika Linzmeier [Pulaski, 10th], Brittany Helm [Muskego, 9th], Reagan Hoopes [Waunakee, 7th], and Brooke Edwardson [Kimberly, 6th].